The Mavs, who have emphasized passing the ball more to find open shooters this season and making a lot of threes as a result, did that very well last night. As in 13 threes made out of 21 attempts (61%), including 8-11 in the first half. A rowdy homecoming crowd of 4100+ (the lower bowl was pretty much full, creating a great atmosphere) was treated a 26-point performance from Jamel Outler on 8-9 shooting (7-8 from outside). It was one of those nights where a shooter is really in the zone, and everything seems to go in. With Outler hitting two threes to open the game, the Mavs had early momentum and led 29-8 after making 10 of their first 11 shots. Even though HBU would eventually get to within 16 in the second half, the game was never in doubt. 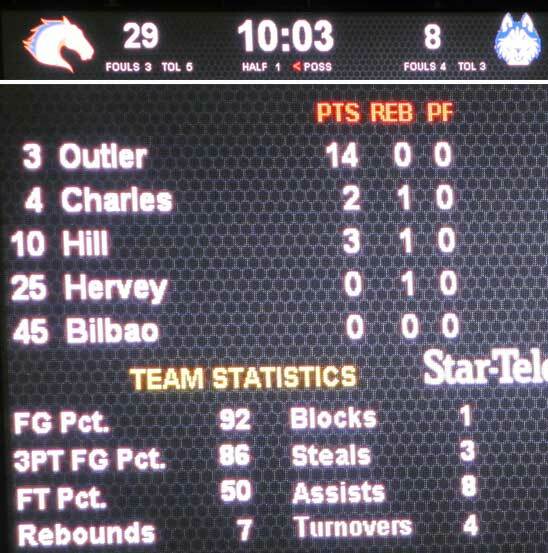 Just too much UTA offense for HBU to overcome, especially the way UTA was playing defensively. And since outside shooting can be all-or-nothing for just about any team, even with the threes falling it was good see UTA also continuing to attack the basket for points around the paint and getting to the free throw line. The Huskies shot 30% FG the first half, and shot the ball very well in the second half on layups on fast breaks and some short jumpers (47%) for 39% FG overall. But, the Mavs defended well and really didn’t allow the Huskies to get many open looks for the most most part. HBU had a really tough night from outside, though 3-23 (13%). The Mavs also did a good job protecting the ball (13 turnovers). Erick Neal again dazzled with some incredible passing with 6 assists (especially on an alley oop late in the second half) and Anthony Walker seemingly defied gravity on an inbounds dunk play…unbelievable how far he gets above the rim. Wow. This was a game the Mavs were probably expected to win, and they played well offensively and defensively to earn it. Next up: Kentucky tuesday night. 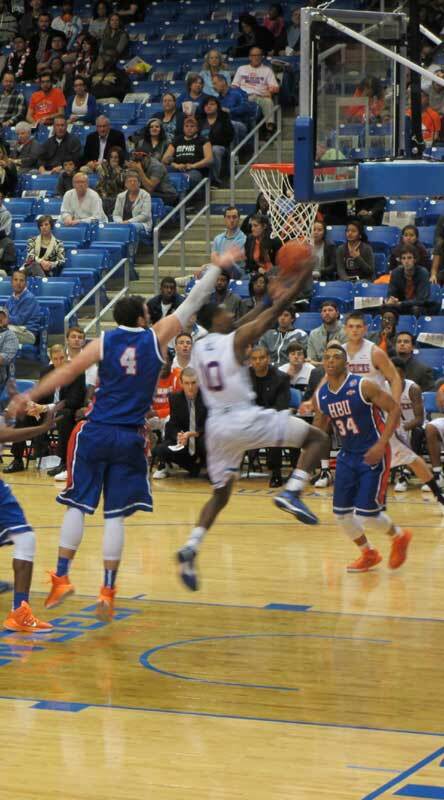 This entry was posted in Basketball, Big Crowd, Erick Neal, HBU, UT Arlington, UTA, Video, Win by rustyhancock. Bookmark the permalink.